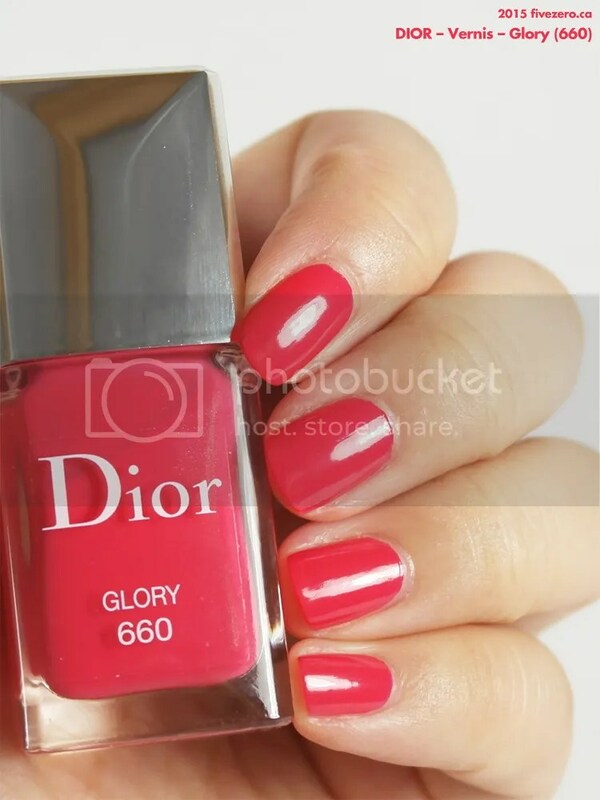 I picked Glory (660) as my first Dior nail polish to try, during a cosmetics sale at Hudson’s Bay a few months ago. It’s a little bit of an unusual pick for me, as a vivid pink shade! I guess it was spring and I was in a girly mood. While it isn’t the world’s most unique color, it is a fine example of a medium-deep azalea pink. It has touches of both cool and warm tones in it, so I feel that it would look great on a wide range of skintones. The color is also very clean, with no muddy tones at all. Glory was just about opaque with two coats, and I think I like the nearly-opaque look with this color. The polish dries to a smooth shine. The application was even and perfect. And, now, I must spend a bit of time discussing the packaging of this polish. The bottle is fine, and very in-keeping with the luxe look that you’re paying for with Dior. The square bottle is slim with just the right amount of heft, and it has a silver-toned outer cap that is gently faceted with a polished mirror shine (kind of a pain to photograph, though). The inner cap is round, ridged plastic and very functional. But the brush is something to behold! It is paddle-shaped, like a beaver’s tail. Honestly, when I first saw it, I recoiled and thought, This can’t be good. I mean, I hate the OPI Pro-Wide brush, and this one is even wider. However, I was quite wrong. The paddle brush allowed me to use just two swipes per nail, except for the thumb. 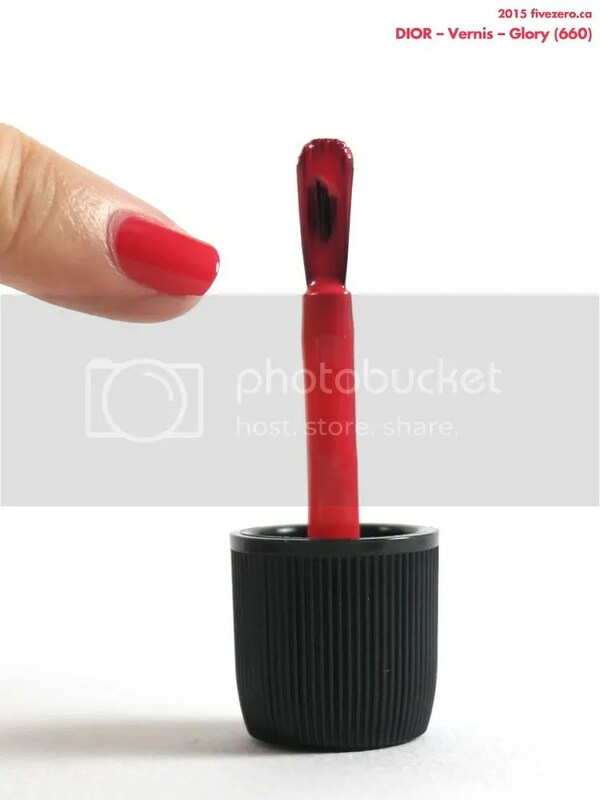 Surprisingly, I did not have difficulty with my pinky nail, which, as you can see from the photo, is just about the same size as the paddle brush, if not a bit smaller once the brush splays a little during application. The only tricky bit was my thumbnails, which don’t have rounded cuticles. They’re more squared-off, and the round end of the paddle brush made it harder to get a neat line along the straighter cuticles. I am really quite impressed by this nail polish, overall. While the price remains on the heftier side, I can definitely see myself picking up another Dior, particularly in a more unusual shade. 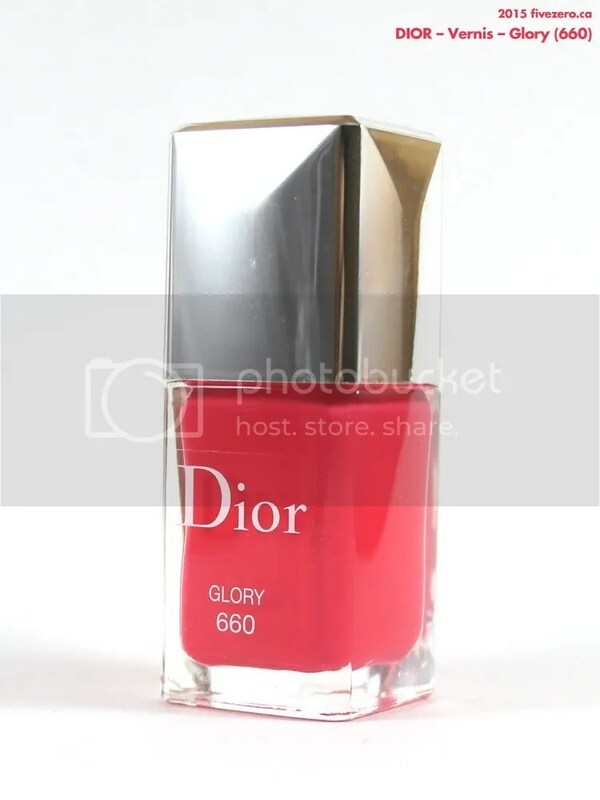 Dior Vernis retails for US$27 / CA$28 and is 0.33 fl oz / 10 mL. The polish is free of toluene, formaldehyde and dibutyl phthalate (DBP), and is made in France. Christian Dior Cosmetics is a division of Christian Dior S.A., based in Paris, France. Dior and LVMH are both controlled by Bernard Arnault. Such an awesome colour and I would say it as a coral pink because the pictures above shows like it has a hint of coral in them and I love your way of picking colours and once again really pretty hue to play around all throughout the hot summer time. Yes, it definitely leans coral depending on the light. Sometimes it goes cool, other times warm. I feel it goes warm/coral on me a lot but I figure it’s because I’m quite warm-toned! I’ve only ever had one Dior nail polish which I’ve since given to my friend who LOVES the colour (some grey creme) but the most outstanding thing to me was also the brush. It’s really nicely shaped and the roundness of the bristles just hug the nail bed perfectly. The polish itself was just ho-hum for me. Have you tried Guerlain nail polishes? Now those, I feel like the price is justified. Oh cool! I am actually really loving the Dior right now. There’s no tip wear (I usually get tip wear after 1 day due to being a bit hard on my hands) and I did not use a base or a top coat. Now I MUST try the Guerlain. LOL. Thanks. The paddle shaped brush is interesting. I’ve only experienced that with another nail polish but it was not high end like Dior! Interesting! Did you like the brush? Which polish was it?